Ever considered becoming an entrepreneur? Where could you start if you wanted to set up your own business? Would you like to meet local entrepreneurs and self-employed people to discover simple and achievable steps you can take in exploring this option for yourself. We will have an expert panel from different industries. Join panel organiser Keith Seville who has just released his book ‘Mine Your Business: A Unique Journey of Self-Employment.’ Keith has run several businesses for more than 30 years. 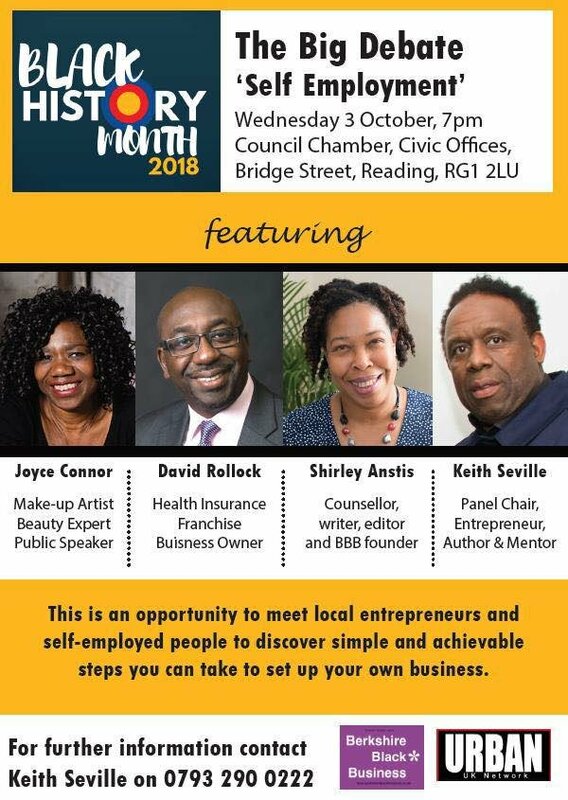 The panel will include members of Berkshire Black Business alongside founder Shirley Anstis who runs a successful counselling and writing practice. We’re working on a couple special guest speakers too. This is an opportunity to find out more about how you can take small steps towards self-employment, build your network, find potential fans and customers. Is there a better way to celebrate black history month? The evening will be free of charge but your learning will be precious.